lol That's just a coincidence. You can only do so much with 8-bit. Saving planet Earth..One pant at the time! I heard there's allot of original stuff you can design with 8 bit graphics. MARS mars NEEDS needs WOMEN woman. .♥♦♣♠ . It's all the bratwurst Mario eats that makes his pants lethal. 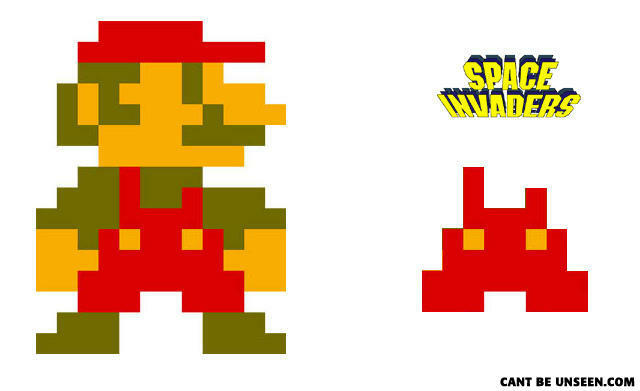 Mario was a spy for the invaders..
reminds me of pixel-y mickey mouse pants. Mario will now forever have something from outer space chomping on his genitalia. Did you hear the one about the koala bear that fell out of the tree?